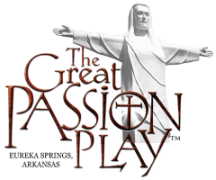 (EUREKA SPRINGS, AR)- The Great Passion Play offers Area Appreciation Days in May, August, and October Passion Play performances for residents of Greene, Christian, Barry, Lawrence, Stone, Taney, and McDonald Counties in Missouri and Boone, Newton, Madison, Benton, and Washington Counties in Arkansas. Residents of these counties can get tickets for $17 for adults, $7 for youth (ages 12-16), and $5 for children (ages 4-11) for performances of The Great Passion Play, and kids under 4 are always free. Simply show proof of residence or employment in the special counties and enjoy the Play, the Bible Museum, the Sacred Arts Museum, free Music Concerts, David the Shepherd, and the Parables of the Potter. Featuring a cast of over 150 actors, the Play is performed amid a 550-ft historically accurate stage and brings to life the epic drama surrounding Christ’s last days on earth, including his death, resurrection and ascension. The Great Passion Play runs 1 hour and 45 minutes, featuring an original musical score composed by Phil Perkins and performed by the world-renowned National Philharmonic Orchestra of London. This year’s performance also features horses, donkeys, and dozens of birds as well as 2 camels donated by the “Wild Wilderness Drive through Safari” in Gentry, Arkansas. Reservations can be made online at greatpassionplay.webconnex.com/area-appreciation over the phone at 800-882-7529, or in person at the box office. Present valid photo ID or proof of residence when you pick up your tickets for performances in May, August, and October.